The old cabinet doors were the 80s style cathedral raised panels. I sanded the old frames which were good quality red oak with a orbital sander. I built Arts & Crafts style inset doors and draws to replace them. 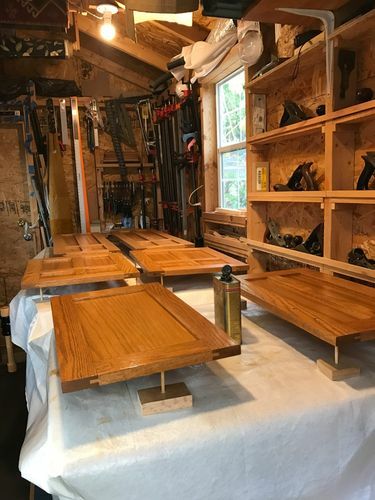 Stained and finished doors on the workbench. I mix my own stain and used Minwax Wipe-on Poly oil based satin finish to avoid over spray in the room. Scrap oak and chop sticks sharpened in a pencil sharpener were made to elevate the drying doors. I made a light shield in the A&C style with four mortised holes on each side to protect eyes from the LED light. This is the bottom cabinet. Hardware was ordered from coolknobsandpulls.com. James, they look great. However, I’m curious why you have a microwave in your launder room? 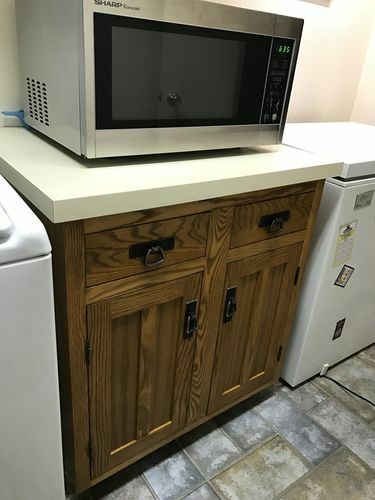 Microwave in the laundry room? In case I get hungry. LOL. There’s also a freezer chest there. The laundry room is next to the kitchen. It’s convenient there and frees up space in the kitchen counter. I also need to put a granite counter under it. Art. I hope that satisfies your curiosity. Nicely done. Beautiful workmanship. Sorry to go off subject, but I however am curious about the artwork hanging under the cabinets. Did you make that as well? 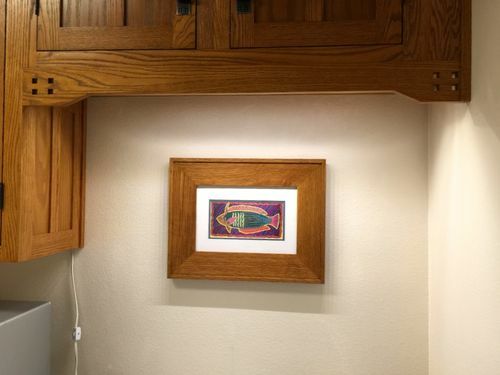 My wife and I are crazy about ‘fish art’. 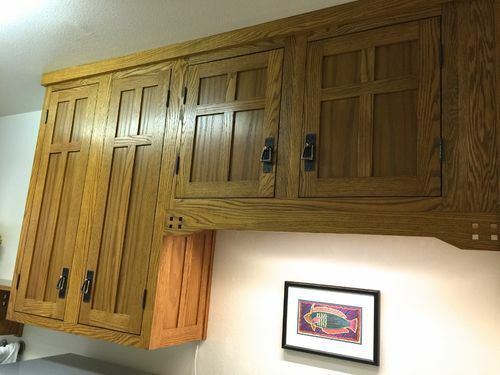 You did a very nice job on these cabinets. Wow, these are seriously beautiful A&C cabinets. The finish looks great too. Very impressive workmanship.